Sir William Cholmeley 2nd Baronet (1625–1663) of Abbey House Whitby was the original landowner for the property. The Cholmeley family owned much of Whitby including several houses on what was known as Cliff Lane in the 1600’s. 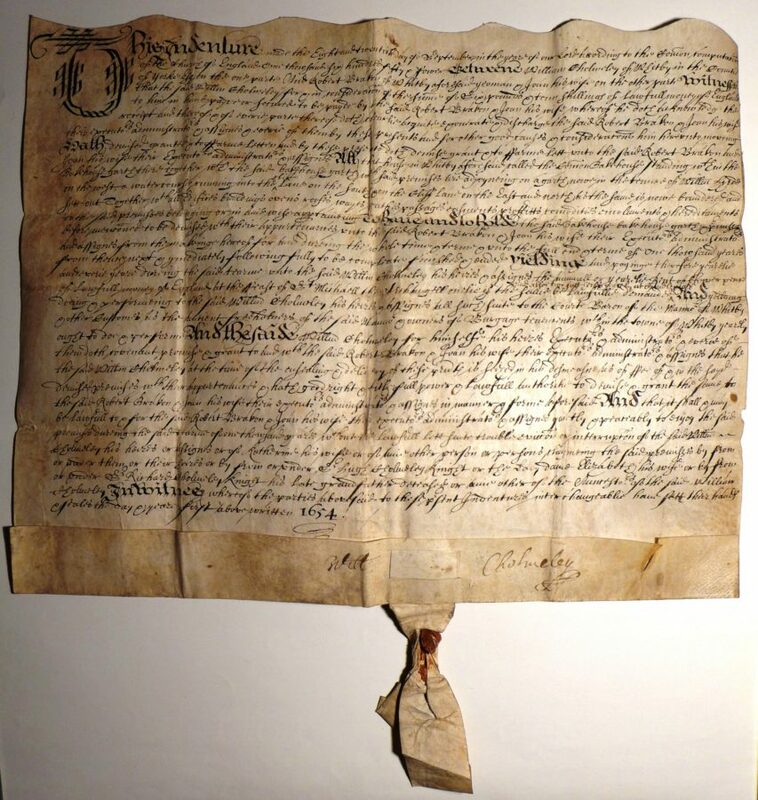 The ancient lease from 1654 shows the first leaseholders as Robert and Joan Bredcon. Will Cholmeleys signature appears at the bottom of the document, above the wax seal. The ancient lease covered what is now No 14, No 15 and also the buildings in the yard behind. The lease changed hands many times over the years with the buildings remaining together until they were eventually split up into individual leases in 1964. In the nineteenth century, both No 14 and No 15 Cliff street were shops that were run by tenants of the leaseholders, and many historical Whitby newspaper ads show the two properties as one business. In the nineteenth century, the coast around Whitby became a mecca for fossil hunters and collectors, and between 1840 and 1880, the business was ‘Chettleburgh’s Fossil and Shell Shop’, selling fossils and shells from the locality and from around the world. Chettleburgh’s successor was William Dalton, and the business then became ‘Old Curiosity Shop’, with trade moving to jewellery produced from jet and ammonites, together with antique fine china and glass. With William and Sarah Dalton in residence, the yard behind the shops became known as Daltons Yard, and a number of small business operated from tenements within this yard, which today is called Oswy Square. Cliff lane is one of the oldest streets on Whitby’s West Cliff and was originally a dead end, it eventually became Cliff Street when the lane was opened up to the Khyber Pass. In the 1890’s an infant school was built on the land opposite No 14, and in the mid twentieth century the shop became a thriving confectionary business, which lasted into the 1970’s. The school eventually closed and was demolished in the 1980’s. By this time, the Cliff Street shops were in a very sorry state, and when No 14 was eventually renovated in 1990 much of the interior timber had to be replaced but the original cast iron kitchen range and lounge fireplace remain.